This is Chuck Brown. He is real and I guess, a monster. I looked at the list of invites and then imagined all of the usual takes on what a monster is thought to be. Perhaps some will be cute, some ugly. I went in another direction. 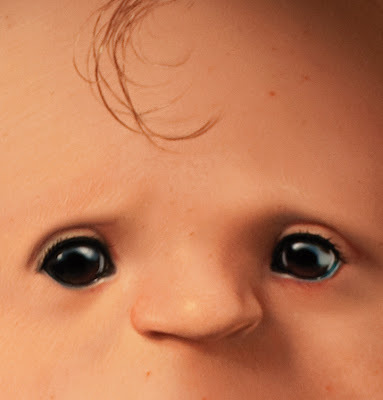 What if I were to paint a realistic version of something usually thought of as cute and benign? For no particular reason and maybe several, I chose Charlie Brown. My son just finished his role as Pig Pen in a play at his school - 'Charlie Brown and the Spelling Bee' and since I was the set designer, I thought about the look of the play for weeks. For some reason we all chatted about that THING on Charlie Brown's forehead. Is it hair or some sort of scar and hair? 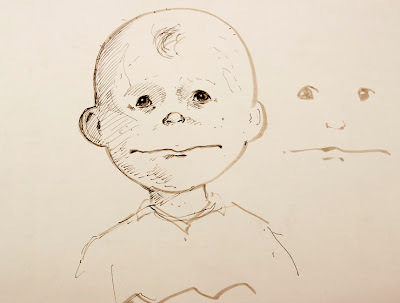 I started with the usual Charlie Brown head but when I started the face, I kept going, imagining his features realistically. Later, away from the studio at the side of a lake, I did a watercolor. Casual at first, I thought about his eye. 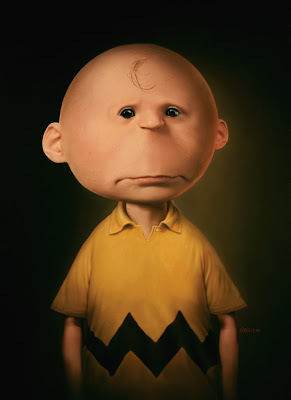 The effect I wanted was that from a distance, someone might think it's just Charlie Brown and as they approached the piece, the realism hit them. Therefore, the eye had to be coal black but real. 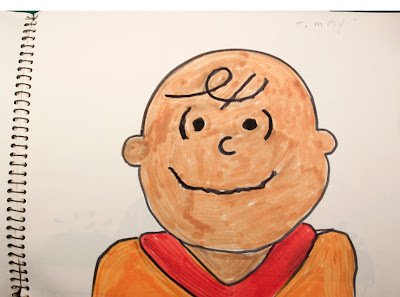 The watercolor worked it out but then the question of how the skin would look, why was he bald and how old is he arose? Who knows? With all the preparation work completed, I did the piece. It's freaky. Maybe not a monster but not normal. A day later while I waited for it to dry I had to prepare for a talk I am giving this weekend. Going through some old sketchbooks I have from my childhood I found one piece that made me smile. This one might have been percolating for years. I think in this version I thought he might be an awkward teen. I chose to stay younger with it. I knew it had to be a solid black eye and then I remembered from my many times painting horses, the huge, dark eyes they have. I used that memory for reference. 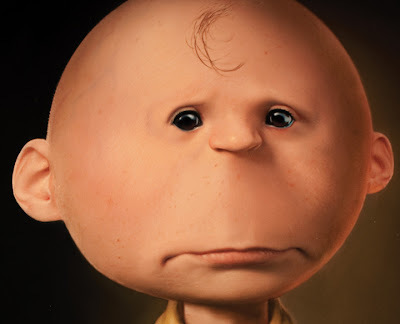 I went for the wiggly mouth and tried to copy the proportions of Charlie Brown exactly. I was surprised at how high his nose was. His eyes have soul but as a whole it's odd. Like everything there is a humanity somewhere in there. 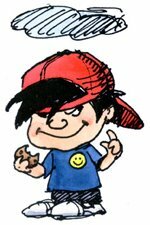 Yes, this is a piece from my sketchbook at about age 7 or 8. I remember liking magic markers but being annoyed with the way they got dark when you doubled over your line. I know if I had photoshop as a kid I would have been in heaven just dropping in tone here and there. Still, there are lessons in failure. That's the lesson of Charlie Brown I guess.